Virginia Gov. Terry McAuliffe has pardoned a minor driving offense committed years ago by an immigrant mother of two, saying he hopes it will help prevent her deportation. Immigration advocates have protested the arrest of 30-year-old Liliana Cruz Mendez of Falls Church, who was taken into custody this month after going with her lawyer to a check-in appointment at an Immigration and Customs Enforcement office. They say her case is emblematic of tougher immigration policies under President Donald Trump. McAuliffe acknowledged his pardon may not affect Cruz Mendez's case, but said he wants to send a "clear message that tearing this family apart will not make our Commonwealth or our country safer." Cruz Mendez's children, 10 and 4, are U.S. citizens, and her husband has a work permit and is pursuing a green card, according to the advocacy group CASA. "If President Trump and his administration are serious about making our nation safer, they will release Ms. Mendez, focus their immigration enforcement efforts on legitimate threats to our public safety and get behind the comprehensive immigration reform our nation needs," the governor said. Immigration and Customs Enforcement spokeswoman Carissa Cutrell said Cruz Mendez can be deported "even without any criminal convictions." CASA said Cruz Mendez fled violence in El Salvador a decade ago. She skipped an appearance in immigration court shortly after arriving in the U.S., which triggered an "in absentia" deportation order against her, according to her attorney Nick Katz. Cruz Mendez stayed off immigration officials' radar until she was stopped by police in 2013 for a broken taillight, and was convicted in 2014 of driving without a license, CASA officials said. They said she has no other criminal record, and was employed at a restaurant, with a federal work permit, when she was arrested by ICE officials this month. Immigration arrests have soared since Trump signed executive orders on Jan. 22 to boost deportations. U.S. immigration arrests increased nearly 40 percent in early 2017 as newly emboldened agents detained more than 40,000 people suspected of being in the country illegally. More than one in four had no criminal convictions. During former President Barack Obama's administration, Cruz Mendez received two deferrals from deportation in 2014 and 2015. 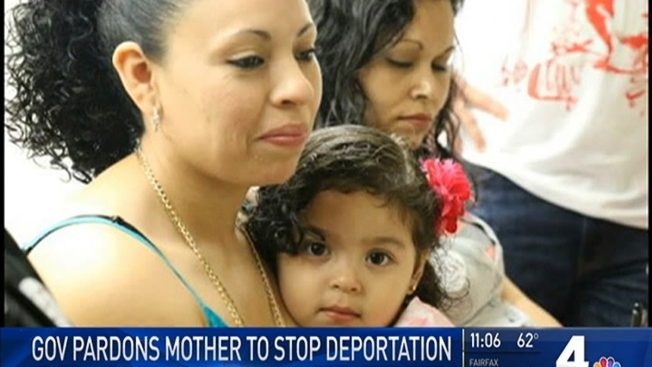 CASA spokeswoman Fernanda Durand said Cruz Mendez's children have struggled with their mother's absence and the fact that she could be deported at any time. "They are not doing well at all," she said.